Science World, in Vancouver, British Columbia, Canada, is an appealing and remarkable science exhibit housed in the Expo Centre. Old and young visitors alike will find many activities in the feature exhibitions, galleries, OMNIMAX theatre, and science theatre; consequently finding many choices of how to spend the day. There are several very fascinating exhibits in Science World, and include the following: 1. Treasure! A demonstration of amazing discoveries on the planet, such as under sea, buried treasures, gold rushes, and treasures found in the home. 2. The OMNIMAX theatre is an incredible 360 degree film experience presenting some of the most intriguing shows, including a wide variety of nature and human interest stories. 3. The Eureka Gallery investigates a fascinating inventory of motion, machines, air, light, sound, and water; providing an assorted array of colorful exhibits and is housed in their largest arcade. 4. Cool Globes is an exhibition designed by numerous artists and community groups that illustrate the effects technology on the world today, encouraging students to become innovators in science and technology. 5. A variety of other galleries, including Search, Our World, BodyWorks, and Kidspace provide answers to many questions about life on planet Earth. 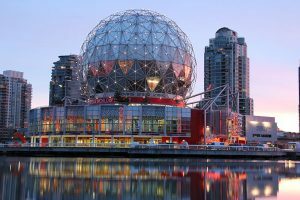 Science World in Vancouver, Canada, provides an entertaining and enlightening setting that explores many components of life, and ensures a variety of educational and interesting activities. —– Planning to come to Canada to improve your English skills? Find out more about English Courses in Vancouver!